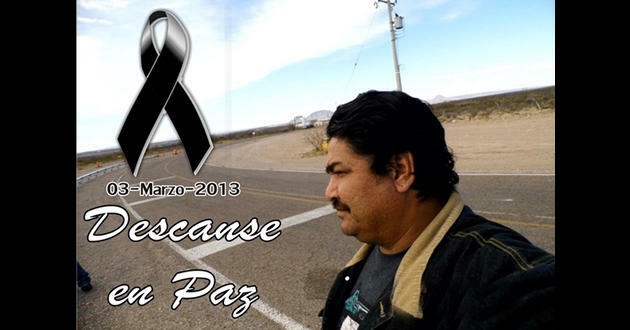 Jaime Guadalupe González, 38, director of a digital journal in the city of Ojinaga, Chihuahua, was killed yesterday while on his way to work (Sunday, March 3). He was shot at least 18 times with 5.27 mm caliber “cop killer” bullets, and his digital camera was stolen. He had stopped to have a bite at a taco stand when he was killed. A woman accompanying Mr. Guadalupe González was unharmed. The town of Ojinaga is on the border with Presidio, Texas. Mr. Guadalupe González worked for the Ojinaganoticias.com.mx news portal. The killing has had the desired effect: the new service is now completely shut down. Early reports are that he was on his way to the office to deliver some photographs he had just taken, as well as his reporter’s notes, when he was killed. It is believed that some images in the camera could have identified members of an organized crime group. The attack occurred at the intersection of 13th Street and Trasviña Retes. Armed men allegedly blocked his way, shot him, and took his camera. According to witnesses, no other object was stolen, leading to the presumption that the sole aim of the assailants was to obtain the camera and its contents. Ojinaga is in eastern Chuhuahua, the most dangerous state in Mexico to be a journalist. The area is hotly contested by Los Zetas Cartel, which succeeded in forcing out the Gulf Cartel a few years ago, but is now fighting off attempts to control the plaza by Mexico’s largest criminal organization, the Sinaloa Cartel.